The international Law of the Sea entitles every coastal state to extend its territory out to 12 nautical miles (NM) from the shore, making these "territorial waters" fully part of the country but requiring that foreign ship traffic be allowed to pass through. The law also allows the country to regulate economic activity out to a distance of 200 NM, within what is called an "exclusive economic zone" (EEZ). Lakes, rivers, and bays (as well as coastal areas hemmed in by islands) are known as "internal waters," where the country has absolute authority just like on its land territory. As a country with an unusually long coastline and possession of several offshore islands, Chile has a long strip of territorial waters and a huge EEZ. But Peru is a bit of a special case: it never ratified the U.N. Convention on the Law of the Sea (UNCLOS), and instead of an EEZ proper, it claims something called a "maritime domain" out to a distance of 200 NM. Because the Peruvian constitution claims "sovereignty" over this domain, it has always been interpreted as equivalent to other countries' 12 NM territorial waters. However, during the court case against Chile, Peru's government declared that its declaration of the maritime domain "is applied in a manner consistent with the maritime zones" in the UNCLOS. * This implies that Peru's "maritime domain" is now to be considered equivalent to an EEZ rather than to territorial waters, thus curtailing any potential accusations of clearly excessive territorial claims by Peru. Since the dispute began some decades ago, Chile claimed that the boundary between the two countries extended due west from the end of the land border. To Chile this meant that it could it extend its own EEZ out to 200 NM directly west from its northernmost coast, but also that the line would keep going from there, cutting off any part of Peru's maritime domain that might wrap around the outside of Chile's (the Chilean government noted that Chile itself had made a similar concession on its sea border with Argentina). This is not one of the recommended ways of drawing a boundary under the UNCLOS, but that would all be moot if, as Chile claimed, the two countries had already agreed to it by treaty. Peru felt differently. It argued that the treaties cited by Chile never explicitly specified a border, and that it therefore was still entitled to negotiate one from scratch. Because Peru's coast is oriented at an angle to Chile's, drawing a straight line west would give Chile quite a bit of sea that was actually closer to Peru. So in an official government map from 2007, Peru instead showed the boundary running southwest at an angle of more than 50 degrees from Chile's line. In court however, Peru made a more modest claim, choosing an "equidistant line" as recommended in the UNCLOS. This meant carefully calculating a path for which every point would be exactly the same distance from the closest parts of the respective Peruvian and Chilean coasts. The result was a not-quite-straight line running southwest at an angle of about 30 degrees from Chile's border claim. The area between these two lines would become the officially defined disputed zone. Another large area west of this chunk was within 200 NM of Peru's coast, but beyond 200 NM from Chile. This zone was claimed by Peru but considered by Chile to be neutral "high seas" (a.k.a. international waters). But where do the lines start? In fact, Chile and Peru were not even able to agree on exactly where the maritime boundary should start. The land border between the two countries had been agreed upon in the 1929 Treaty of Lima, and precisely marked on the ground with actual physical pillars. However, the last of the pillars was not right on the shore. Known as Hito 1 (Spanish for "Marker 1"), it was placed on dry land a bit inward from the beach, to ensure that it wouldn't be washed away. Peru argued that the border continued, in principle, in a slight curve southwest from Hito 1, following the same circular arc that was used to place the last several border pillars. The treaty apparently wasn't drafted with this extreme degree of accuracy in mind, and was worded in a way that suggested Hito 1 and the shoreline were the same thing. Chile used this to argue that the sea boundary should be measured along a line drawn from the pillar itself (but not starting until the line reached the seashore), and not from a point to the southwest as Peru claimed. This was taken by many to mean that Chile claimed a land border continuing west from the pillar, but in court Chile's lawyers argued that there simply was no legally defined land boundary beyond Hito 1. After years of waiting and over a year of deliberation, the court finally released its ruling on January 27, 2014. Media headlines declared the judgement a "win" for Peru, but in fact it was a complex compromise arrived at through a step-by-step examination of each country's claims. The court first needed to decide where the maritime boundary should start. 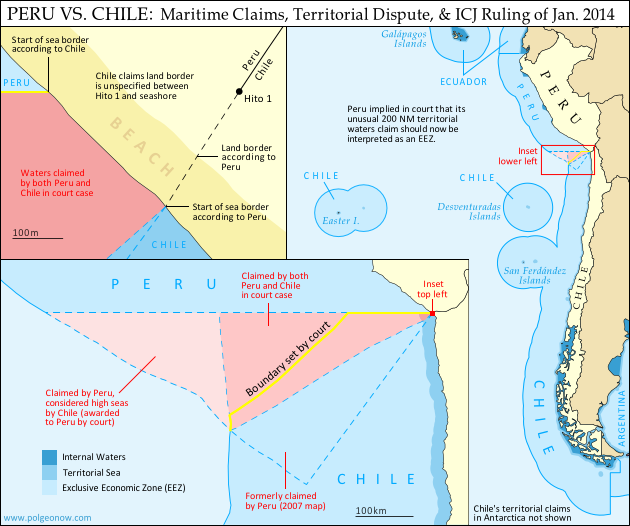 Although Peru argued that it was impossible for a land border to just end without reaching the coastline, the court found that before the dispute began, the two countries had consistently used Hito 1 to define where their respective waters met. This was a small win for Chile, meaning that the maritime boundaary must indeed be drawn from the marker itself rather than from the end of an arc as claimed by Peru. However, defining the land border itself was not on the court's agenda, so the disagreement over its course technically remains standing. The court noted that the land border does not necessarily have to end at the same place the sea border begins, meaning that Peru's claimed land border extension could still be valid even now that it's irrelevant to the course of the sea boundary. To examine the history of Peru and Chile's claims, the court examined a series of declarations and treaties published by the two countries in the 1940s and 1950s. It found that both countries had indeed declared jurisdiction out to 200 NM, but that they initially didn't have any particular border in mind. Instead, their early declarations were intended to protect their waters from foreign whaling and other exploitation, not from each other. With each treaty they increasingly implied that there was a border running straight west from the coast, but never seemed to say it explicitly. It seemed that perhaps an informal agreement had been made and never put on paper. However, the last treaty referred clearly enough to a straight-west boundary that the court decided it was a done deal. The maritime boundary between Chile and Peru would be line running straight west from Hito 1 - a win for Chile. But wait - it wasn't as simple as that. Although the court agreed that Chile and Peru had fixed their straight-west border by treaty, it argued that they had never intended for it to run all the way out to 200 NM or beyond. The agreements referring to the border were only concerned with defining where local fishing boats were allowed to cast their nets, and back then these small boats wouldn't have ventured out past about 80 NM. The court's decision, then, was that the boundary should run straight west only to a point 80 NM from the shore - beyond that, there was no line legally agreed upon by treaty. Beyond 80 NM, the court ruled that Peru indeed had the right to a boundary calculated from an equidistant line out to the farthest point within 200 NM of both countries' coasts. But since this line started from the end of the 80 NM straight-west line, it ended up quite a bit farther north from Peru's claimed boundary, giving Chile nearly half of the disputed zone. However, it was still seen as a substantial victory for Peru, since Chile had been seen as controlling the entire zone up until then. The court also ruled that Peru was indeed entitled to any area of sea within 200 NM of its own coast but beyond 200 NM from Chile. This means that the area previously considered high seas by Chile will indeed become part of Peru's maritime domain, and even after drawing the equidistant line, a bit of this zone still wraps around the outside of Chile's EEZ, adding one more segment to the maritime boundary between the two countries. Though the course of the land border may remain a small sticking point, the sea dispute between Peru and Chile has now been settled (that is, unless the countries argue over the exact coordinates of the line, which were not explicitly named by the court). The ICJ's ruling is binding, and both Chile and Peru have agreed to respect the court's decision. Peru's president Ollanta Humala said he was "pleased" with the ruling, and that he would act quickly to ensure its implementation. President Michelle Bachelet of Chile, on the other hand, called it a "painfull loss," even while promising to "gradually" implement it. Graphics of the Peruvian flag (source) and the Chilean flag (source) are in the public domain.